Depending on which survey you read, the Margarita may be the most popular cocktail in the U.S. There are scores of variations, from Ginger Margarita and Melon Margarita to Frozen Grape Margarita to a Frozen Kiwi Cilantro Margarita. 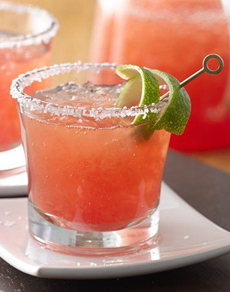 For Cinco de Mayo, we’re adding a new Margarita recipe to our repertoire: the Blood Orange Margarita. The original Margarita was made with tequila, Cointreau and lime juice. Here’s the story and more Margarita trivia. The recipe was developed by Chef Billy at Prepara.com. If you can’t find fresh blood oranges for the purée, look for frozen purée or substitute refrigerated blood orange juice. Toast Cinco de Mayo with a Blood Orange Margarita. Photo courtesy Betty Crocker. 1. PREPARE the optional salt rim. We like to mix 1/3 orange zest with 2/3 salt (zest the orange before squeezing the juice). Dip the rim of the glass into 1/4 inch of water, then twist in a dish of the salt or salt mix to create the rim. 2. COMBINE all of the ingredients in a shaker. Shake well and strain into a glass with more ice. Garnish as desired and serve. 1. ADD all ingredients to a blender or food processor and purée. Taste and add more simple syrup and.or lemon juice as desired.